Beginning of a big size canvas (2m long) ! I’ll post pictures of a few steps of the creation of this painting, this “work-in-progress” (WIP). 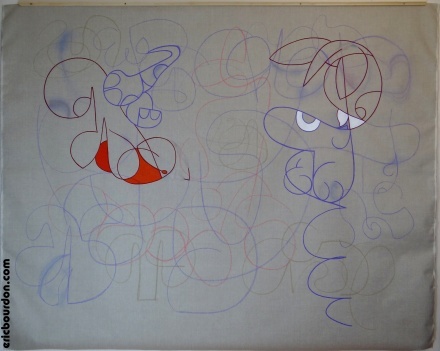 First creatures found from this chaos of chalk drawings : one is a kind of guitarist whithout a guitar, the other, on the top of a mechanical spring, could be a singer. Beginning of a new rock band ?